With one look, this helpful tool details the cost of maintaining comparable flooring options over time. Surface Solutions receives many requests from customers to help them choose an appropriate high performance industrial flooring system for their facility. Regardless of the type of business – food and beverage, chemical processing, healthcare, pharmaceutical, manufacturing, electronics, brewing or wine-making, retail and more, several factors influence our final recommendation, including the cost of maintaining the floor properly during its lifespan. 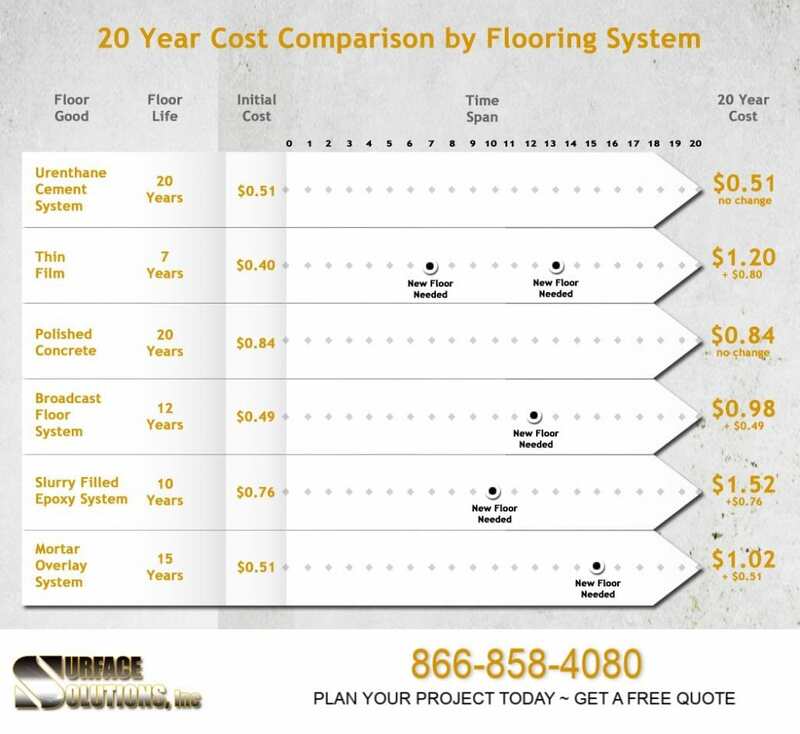 Surface Solutions has developed a quick-look scale that illustrates the lifespan of six different flooring systems and the costs associated with keeping each one in tip-top shape, including when a new floor will be needed. Armed with this information and our expert advice, you will be able to make an informed decision with ease. Comprehensive single source warranty – covers both labor and materials against defect. This is one of the ways we guarantee the quality of our work.